Cortana only works with Microsoft Edge, Facebook releases Windows 10 apps, Google lets you know when apps have ads, Uber insists you shouldn’t tip your driver, and a madcap inventor creates a homemade hoverbike. This makes perfect sense from Microsoft’s point of view, as it guarantees a smooth user experience, and gets people using more of its products. Essentially, if you want to use one (Cortana), you have to use two others (Bing and Edge). Facebook has released a trio of new apps for Windows 10. Namely, Facebook, Facebook Messenger, and Instagram. There was previously a Facebook app available on Windows 8, but it was pretty poor, leading most users to simply open Facebook in a Web browser instead. These new native Windows 10 apps have all of the features regular Facebook users will be familiar with. For Facebook itself that means the full set of reactions, stickers, and event reminders. There is also an in-app browser, which means you can open multiple tabs at once, with Facebook clearly hoping this will encourage more sharing. Facebook Messenger, which has never been available as a Windows desktop app before, features group conversations, stickers, and GIFs, with native desktop notifications keeping you up-to-date at all times. The Instagram for Windows app has been launched on Windows 10 Mobile first, and supports Live Tiles as well as all the features regular Instagram users will be used to using. Seeing as Microsoft seems to have abandoned Windows 10 Mobile Microsoft Commits to Windows 10 Mobile, YouTube Ads You Can't Skip... [Tech News Digest] Microsoft Commits to Windows 10 Mobile, YouTube Ads You Can't Skip... [Tech News Digest] Microsoft hasn't given up on Windows 10 Mobile, YouTube launches unskippable ads, Microsoft releases Word Flow for iPhone, Amazon improves FreeTime Unlimited, and Apple extols the virtues of onions. Read More for the time being, having Instagram officially available is sure to be a boost for the small number of people using it. The best part about ordering presents online is how what you just ordered shows up as banner ads for the next month. Google Play is now labeling apps which contain advertising, as we previously reported it would Google Targets Ad-Supported Apps, Amazon Adds Extra Security... [Digest] Google Targets Ad-Supported Apps, Amazon Adds Extra Security... [Digest] Google labels apps that rely on ads, Amazon adds 2FA, Twitter starts testing bigger and longer polls, Push Me Pull You is bound to cause arguments, and a reason not to buy Star Wars Battlefront. Read More . Users will see this as a “Contains ads” note on an app’s listing, right next to the note warning them of “In-app purchases”. This is the first time Google has advised users to expect advertising, and it should help people decide whether or not they want to install certain apps Top 10 Android Apps Everyone Should Install First Top 10 Android Apps Everyone Should Install First Got a new Android phone or tablet? Then you absolutely need these apps! Read More . While this is a positive move on Google’s part, with transparency always a thing to be applauded, there is an obvious rule of thumb to employ when installing apps. Only a tiny percentage are given away for free with no method of monetization, so an app will either cost money up-front, contain in-app purchases, or be funded by advertising. Simple. Uber: You Don’t Need to Tip Your Driver! Uber, the ride-sharing company which wants to kill traditional taxis What Is Uber and Why Is It Threatening Traditional Taxi Services? What Is Uber and Why Is It Threatening Traditional Taxi Services? Uber has landed, and it's fundamentally changing inner-city transit. And some might say, not entirely for the better. Read More , recently settled two class-action lawsuits brought by drivers. Settling will cost Uber $100 million, but means the company can continue treating drivers as independent contractors rather than employees. As part of the agreement, Uber said it would allow drivers to start soliciting tips from passengers, an activity formerly discouraged. Cue disgruntled passengers feeling a need to start tipping to preserve their rating and, as a consequence, their chance of being picked up. The problem is that mutual rating system which means that drivers and passengers both rate each other at the end of a journey. If you don’t tip your driver there’s a good chance they’ll give you a lower rating now than they would have previously. So, despite what Uber is saying, tipping is now a part of the experience, whether you like it or not. And finally, it turns out you can make your own hoverbike at home, at least if you’re Colin Furze and have the backing of Ford. Which most of us aren’t and don’t. Still, we get to watch Furze try and wrangle his homemade hoverbike around his garden without losing a limb. Which is fun in itself. Furze is a madcap British inventor who has made a name for himself on YouTube These YouTubers Are Earning Millions: What's Their Secret? These YouTubers Are Earning Millions: What's Their Secret? Here is a list of the biggest channels on YouTube and how they got to be so popular. Who know, perhaps you'll learn the secret to making it big on YouTube. Read More , but this homemade hoverbike may be his most ambitious project yet. He used an S-shaped metal frame, two two-stroke parajet motors, and two propellers in order to get this thing off the ground. 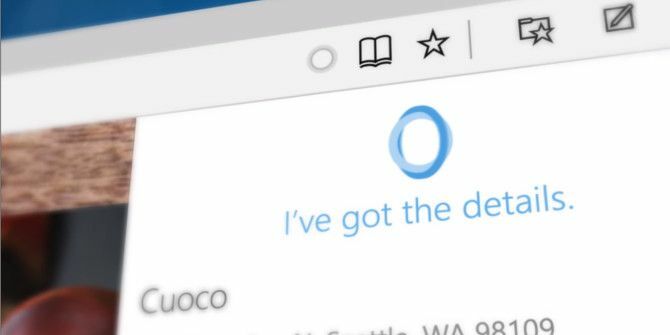 Are you annoyed at Microsoft for confining Cortana to Edge? Will you be installing the new Facebook apps on Windows? Would you rather pay for apps or put up with advertising? Do you tip Uber drivers? Would you like to own your own hoverbike one day? I Use WIKIPEDIA All The Time And Will Continue To Do So, No Matter What. Have You Used The Service In The Last Few Days ? Did You See The Huge Font Notifications On The Top Of The Page ? How Many Notifications Versus Page Visits Did You Get ? >50% ? I Have Never Seen The Service This Desperate. So basically they just ensured I will never use Cortana for web searching again. If they honestly think that a lot of people are going to give up their browser of choice just to use Cortana they're dreaming. In reference to Google labeling app that have adverts, I hope this will highlight those paid for apps that have adverts in as well. There are not many, but upto now it's only been by reading reviews of paid for versions can we find those naughty apps that continue to badger us with adverts after we have already paid for them. I'm all for developers making money for their work, but I do think it's wrong take cash from users AND sell space for adverts at the same time. I've just started to get used to Cortana, finding out what it's capable of and finding new things to utilise it with. If Microsoft are going to restrict it's potential ie, integration with other programs, then it will fail. It's a huge shame as I think there is a lot that it can be used for but now Microsoft are making a bit of an error in order to make up the numbers of it's "lesser" products. re:Cortana - Ah yes, the Microsoft way, instead of building an irresistible product, just FORCE people to use it until you cancel it. That sure creates goodwill.